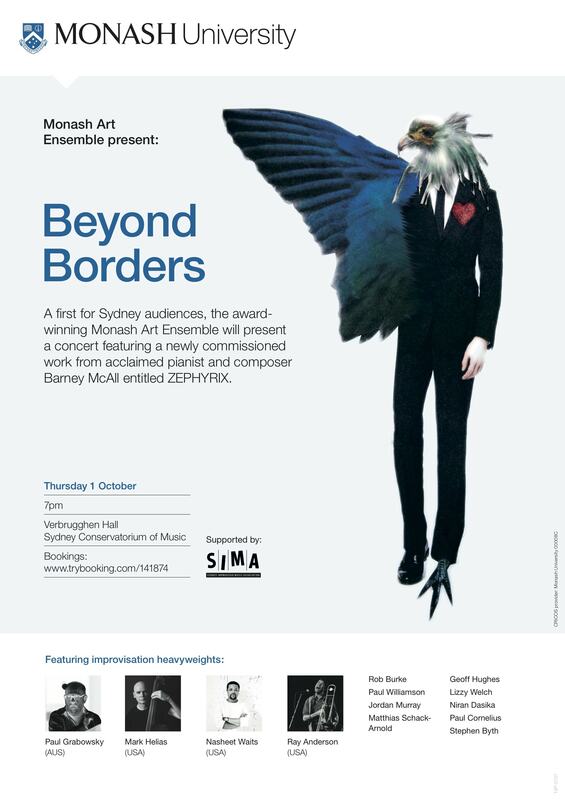 A first for Sydney audiences, the award winning Monash Art Ensemble will present a concert featuring a newly commissioned work from acclaimed pianist and composer Barney McAll – “Zephyrix”. The ensemble will be joined by prominent international musicians Mark Helias and Nasheet Waits to create a highlight of heavy weights of the world of improvised music. “The Zephyrix is a mythical figure symbolising the tension between the restrictions of life – the mundanity, the struggles and sometimes evils of life – with the liberating creative expression of who we really are – our true selves.The piece endeavours to express the strain and colors of this dichotomy and the potential emergence of a newness of mind or metanoia”.